Today's PBOTD is one of my more tenuous efforts to connect with the National Horse Show. 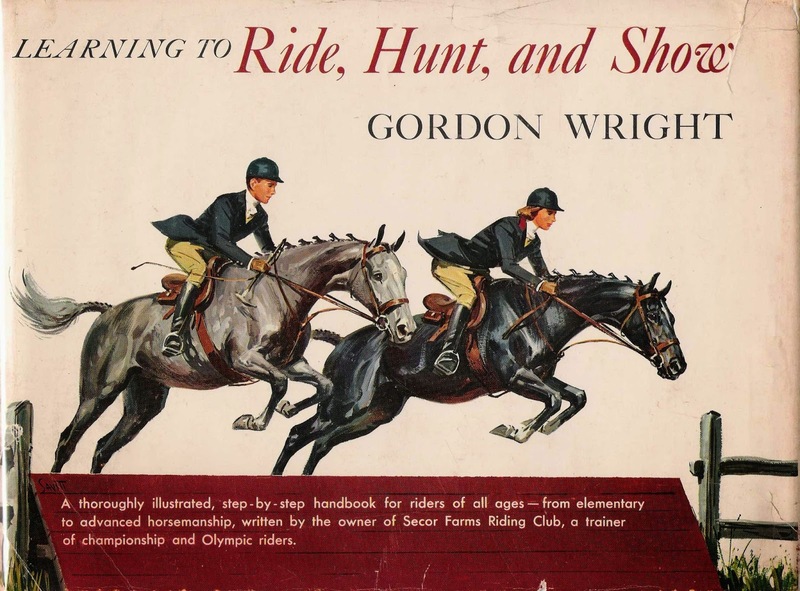 Today's author, Gordon Wright, was a successful show jumper in his own right, as well as a fine trainer. In 1962, the National Horse Show honoured the winners of the Hunter Seat Equitation Championship: over half of them were students, or former students, of Gordon Wright. He trained members of the United States Equestrian Team too. Today's book is a real life story. 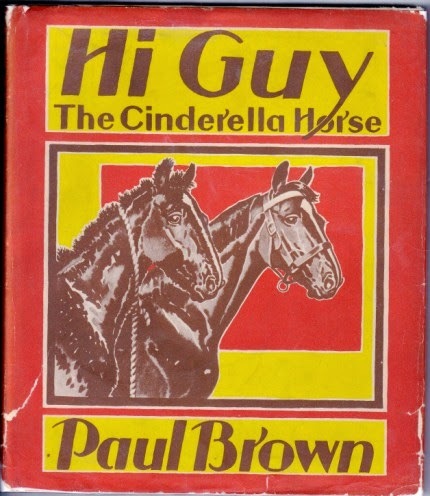 It's written and illustrated by Paul Brown, probably the most sought after equine illustrator in America. Paul Brown started his career as a commercial illustrator, a career interrupted when he left America to serve with the First Light Infantry Division in World War I. He missed death by inches when a grenade shot past him just as he turned his head. When he returned to America, he picked up the reins of his business again, and carried on doing commercial illustration. I have an uneasy feeling I might have already covered this book once, but I do not care. It's one of my favourite pony books, let alone one of my favourite JPTs. And it has one of my favourite covers. I have no idea who did the beautiful illustration for the 1970s Armada edition (pictured below), and I wish I did, because I'd love to tell them how very much loved that cover is: and not just by me. Prince Among Ponies (1952) features someone who popped up frequently in her books: the person who will not listen. Six Ponies was dripping with them, with Evelyn Radcliffe being possibly one of the worst. In Prince Among Ponies, it's bolshy Jane who takes this role. Hero and heroine of the book Patrick and Sara have gone to stay for the summer with Jane’s family, the Merrimans. Patrick and Sara live in suburban London, where they have learned to ride with an instructor who has Pullein-Thompson approved attitudes to equitation. 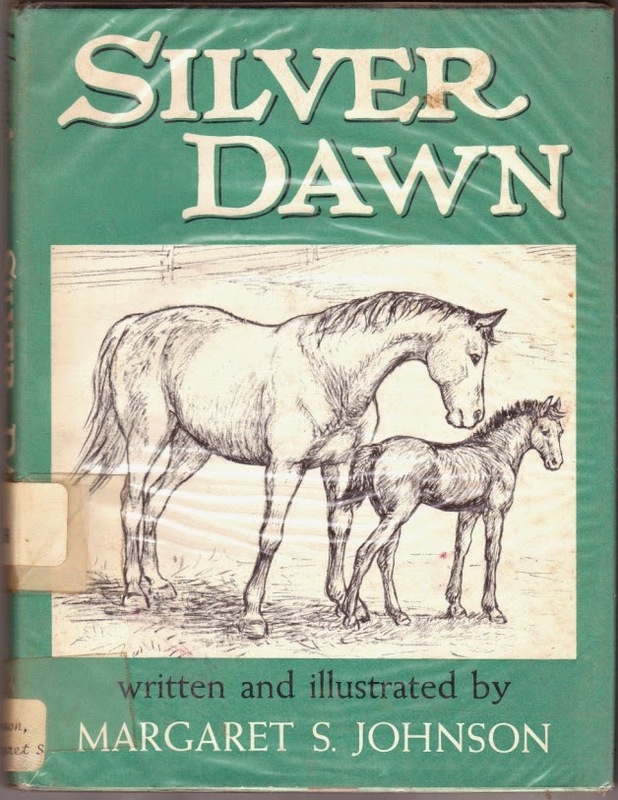 Today's PBOTD is Margaret S Johnson's Silver Dawn (1958), the next in my National Horse Show series. This one is about Julia Braddock, and her horse Silver Dawn. Julia's father runs a training stable, and he helps Julia get Silver Dawn ready for Madison Square Garden. It's one of those bittersweet stories. As often happens when your parent earns their living from horses, those horses have to be sold, and the more successful they are, the more money you get for them. Sadly for Julia, that is exactly what happens to her. Author Margaret S Johnson wrote and illustrated Silver Dawn, but several of her other books were illustrated by her mother, Helen Lossing Johnson. Below is Stablemates (1942), which is particularly pretty. Today's PBOTD, and those for the next few days are all related (sometimes a bit tenuously, I admit) to the National Horse Show in America. When I was researching this post I found out a whole load of things I hadn't known before. The show was held at not one, but three versions of Madison Square Gardens in New York. It was started in 1883 by a group of sportsmen, and in 1890 moved to the second Madison Square Gardens. And in 1926, it moved to the third Madison Square Gardens. In 2011, it moved yet again, but this time right out of New York to the Kentucky Horse Park. 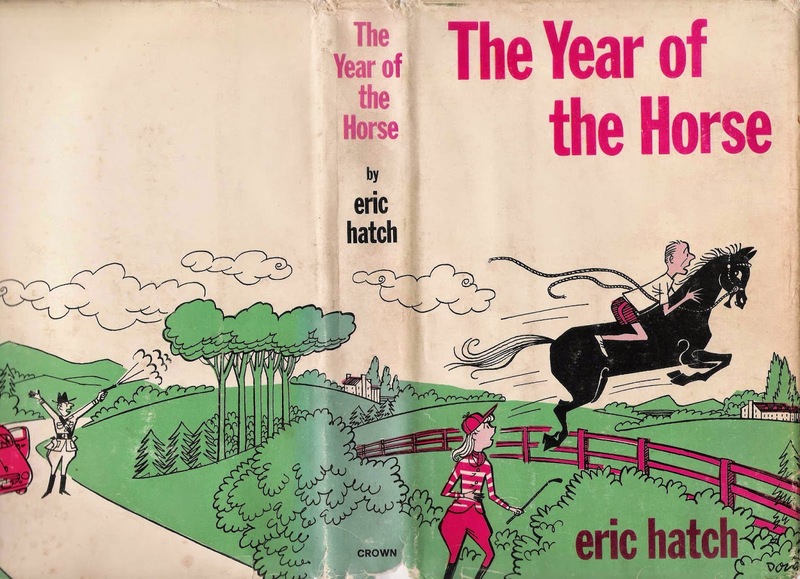 Eric Hatch, author of today's book Year of the Horse (1965), was an author, owned a radio station, and was an expert horseman, a judge and a steward of the American Horse Shows Association. I think this is going to be a post which is principally of pretty pictures, because my lovely plan, which was to read some of these stories before I featured them, hasn't actually come to anything. 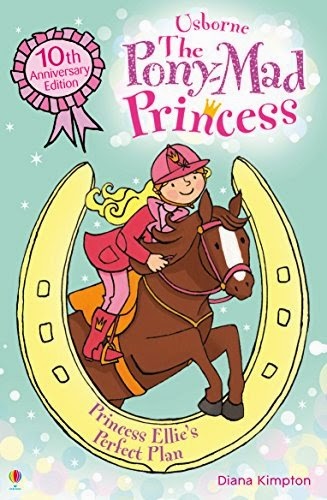 What I will say is that I think this series is possibly the first in the UK pony book world to write an entire series from different points of view in each book. Do correct me if you think I'm wrong. It's a format that has been used relatively recently by Kelly McKain in her Pony Camp Diaries series. I can't believe that I haven't already covered this book, but I haven't. It's Patricia Leitch's first book, To Save a Pony (1960), published under the name Pat Leitch in 1960. The Dallas family re-locate to Scotland and start a riding school in order to keep the wolf from the door. 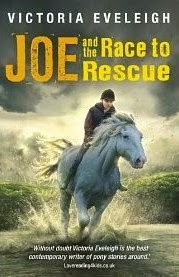 The family, including youngest child Jane, go to a local horse sale to find ponies, and Jane sees a pony she is desperate to save. The conventional pony story would at this point either have Jane spending her little all on the pony (because she conveniently has savings, probably augmented by what she can beg from her siblings) or frantically coming up with some money making scheme in order to make the money to buy the pony. This scheme is, ultimately, successful. Jane tries to take the route of raising money, but it doesn't go according to the pony book plan. I am slightly handicapped attempting to write about Christine Dickenson's Dark Horse (1973)because firstly the lovely piece I'd semi-written in my head has actually used the plot of a totally different book, and when I went to find my copy of Dark Horse to check the details I found I do not actually have a copy. Ah. It's quite a few years since I read one of the Princess Ellie books. This is the latest, and it's an object lesson in how to get a nuanced story for the younger reader into 90 pages. Princess Ellie, because she's a princess, has to do things in a certain way. There are no gymkhanas for her, because the photographers and press who would flock round the moment they knew she was there would wreck it for everyone else. She has lessons on her own with the Royal Governess, and dinner is something you dress up for. Every day. Besides her ponies, there's one person who makes all this bearable for Ellie: her best friend Kate. Kate is the grand daughter of the palace cook, and lives with her grandparents because her parents are often away working. And then they come back, with the news that they're going to send Kate to boarding school. Today's book looks at riding schools in America, although to be fair Ashford Stables are rather more of a training establishment for people with their own horses than anything else. Still, human nature is the same everywhere. Heroine of this book, Cindy, gets a summer job at Ashford. A dream come true, she thinks. Cindy loves horses with that slightly misty passion common to so many girls, and it's a terrible shock to her when she realises just how far some of the people at Ashford will go in order to win. Mind you, ruthlessness in the pursuit of success has not exactly gone away. There are still, sadly, any amount of shenanigans going on in the showing world, and if I can pick out just one truly hideous example about which I've written in the past, Tennessee Walking Horses are still sored to produce the Big Lick, a slightly bizarre gait much prized by people who show the horse. They Rode to Victory (1972) is the sequel to Riders on the March. The comprehensive school team is going to compete against a team from a smart girls’ school. This is something of a fixture: the poor team never competes against another, possibly even less well off team. (K M Peyton's Who Sir? Me Sir? and Zita White's The One Day Ponies come to mind). They always have to show that grit and determination can win out against teams dripping with cash and wonderful ponies. Life of course is not fair, and in real life sometimes those teams might have won, but it's just as likely not. Literature though is often about fairytales, and morality. If you worked hard, maybe you too could do as well. There were a few books I acquired as first editions, and Christine Pullein-Thompson's Riders on the March (1970) was one of them. Of the Pullein-Thompsons, it was Christine who worked hardest at being relevant. 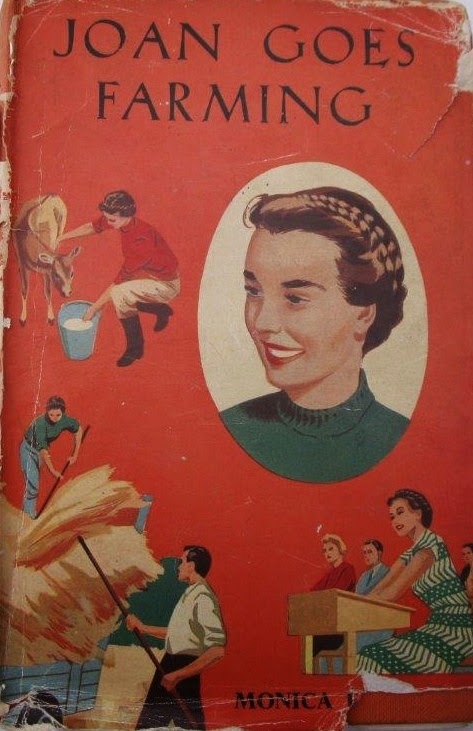 Even in the 1950s, decade of the middle class pony owning child, Christine used working class characters. The First Rosette (1956) had as its hero David Smith, the youngest son of a family where money really is an issue: David’s family genuinely struggle, and there is no money for riding lessons, let alone ponies. It took me several years to write Heroines on Horseback, my book on the pony book. When the book finally had its last edit, my editor asked me for more quotations from several books, but I had to say no because I didn't actually have a copy of the book myself. There were several books I analysed and made notes on and then promptly sold. 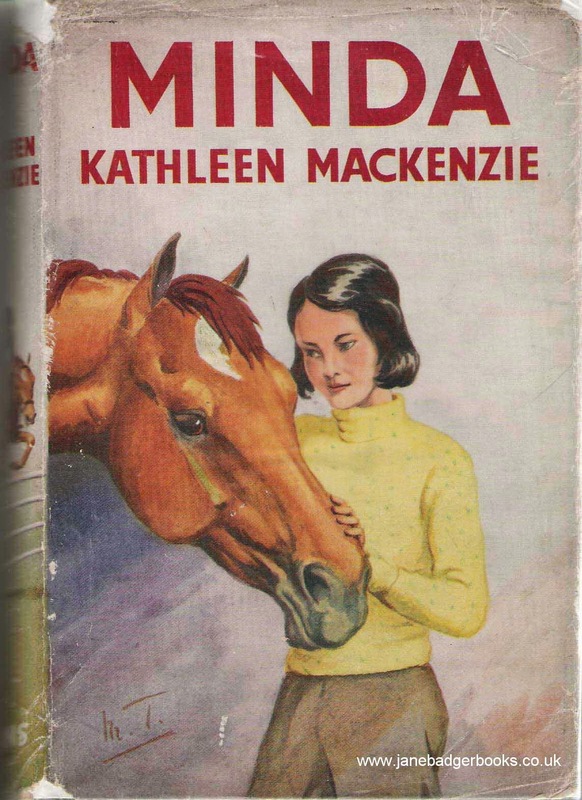 Minda (1953) was one of them, and sadly it made so little impression on me it didn't even make it into my book. 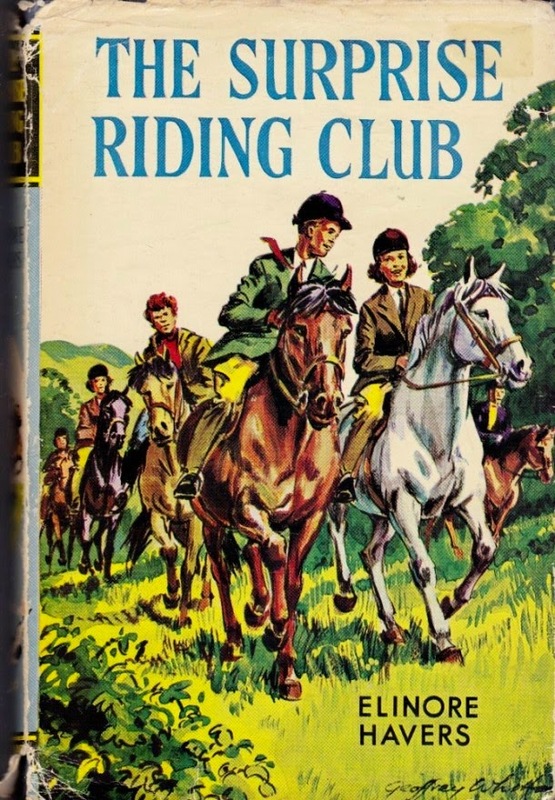 It does carry on the theme of riding clubs, because heroine Minda Budge (who sounds as if she should make it into a Jill book on the strength of her name alone) joins a Pony Club started by three children. As we saw a couple of days ago, joining a club run by your peers can be tricky, and so it proves here. Another member of the club, Jill, is jealous of Minda's talents and schemes to keep her out of an event in which she will represent the club. I think you can probably work out the outcome for yourselves. Today's PBOTD is another book that's more notable for its illustrator than anything else. 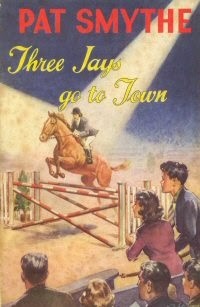 Christine Leslie's Four Start a Riding Club (1963) is one of those books which had sunk into total obscurity. I first ferreted it out myself when I wrote about Anne Bullen for Fidra Books' newsletter. It was cheap as chips at the time as no one else had even heard of it, so I hoovered up a copy. Sadly the book wasn't an undiscovered gem. The Tollhouse Riding Club is launched by Karen, Gilla, John and Patrick. They don’t agree about much, and have some healthy fights about how to do things, but do in the end manage to get the Riding Club going successfully. And that's about it, really. 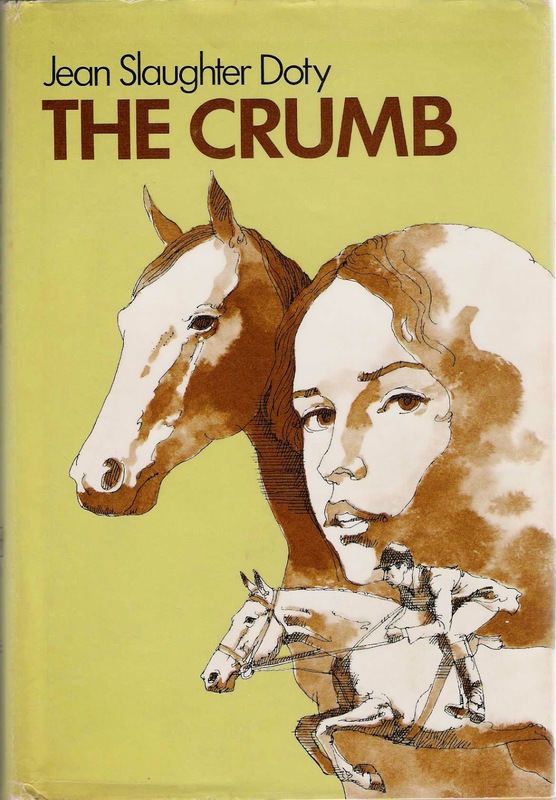 Illustrator of the book, Anne Bullen, died young at the age of 50 in 1963, and Four Start a Riding Club was the last pony book she illustrated. If you follow my Facebook page, keep watching, because I have an exciting Anne Bullen related giveaway coming up. 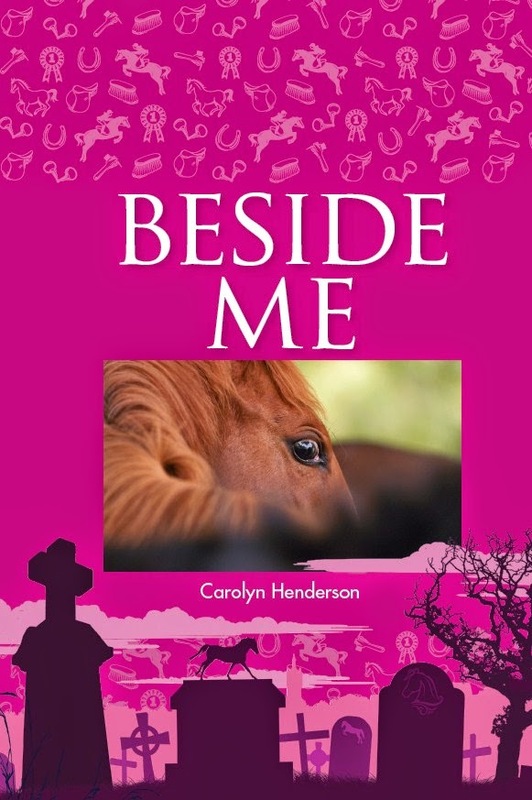 Carolyn Henderson’s Beside Me is based on her Grey Ghost, which she originally wrote for Caroline Akrill at J A Allen. If you’ve read that book, don’t assume you’ve already read Beside Me, because you haven’t. There are a few similarities, but Beside Me is a very different book. I liked the original, but I love this version. It’s subtle, involving, moving: I read it for the second time at our local coffee shop, having forgotten that it made me cry the first time. 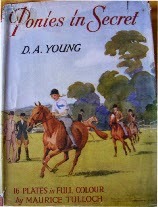 D A Young's Ponies in Secret (1955) is another book about a riding club, but it's also about what happens when power goes to people's heads. When the book opens our heroes are hugely excited by the prospect of a summer filled with ponies. They're even more excited when they learn there's a local riding club, but then they meet the people who run it, who are not actually much older than them, but have rigid ideas on what's what. The book is a well observed story of the wielding of power, and of how easy it is to misinterpret what people do. This is Elinore Havers' first appearance in PBOTD, and it's taken her 10 months. This is I suppose because she's not one of my favourite authors, and so she, like a few others, has taken something of a back seat in PBOTD. Her Surprise Riding Club is an ok sort of read - pedestrian, if I'm being honest. Sarah and her friends start a riding club during the summer holidays so they can improve their riding. The “Surprise” element comes in as each President is supposed to provide a surprise for the members when they finish their time as President. Most of Elinore Havers' books were published in the Crown Pony Library series. 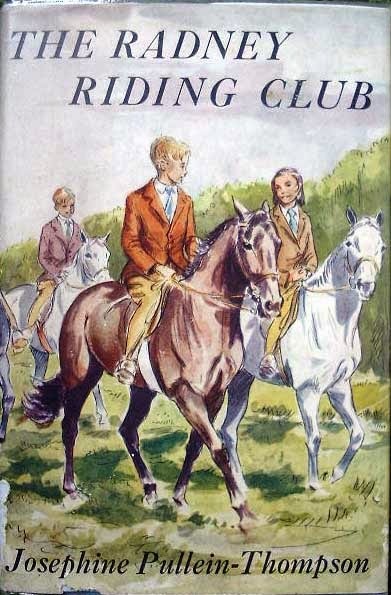 The Surprise Riding Club was published by Collins, and made an appearance in the Collins Pony Library. I wonder if the appearance of her books in pony libraries is the key to understanding her appeal: she writes books which tick all the boxes required by the pony lover, and is utterly reliable in doing so. a. Whether the local library had them b. Whether our (rather limited) supply of local bookshops had them c. Whether a noble relative living elsewhere found the book d. Whether I hit the jackpot at a jumble sale (vanishingly rare) e. Whether I could borrow the book from a friend - not something that happened often as none of my friends were pony book fans. 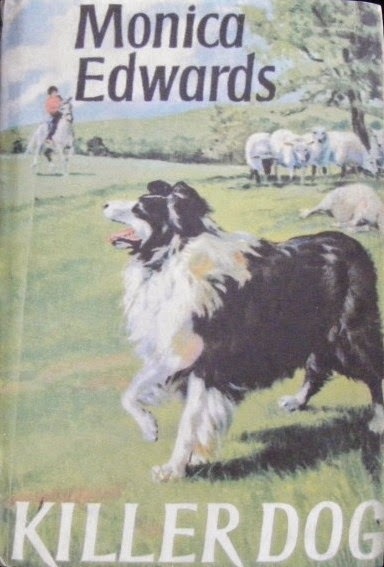 I've reached the end of the HOYS section, so am doing a swift detour back because I didn't include Monica Edwards' Killer Dog in my round up of her books. Granted, it isn't particularly horsey, but then neither are quite a few of her other titles, and I've included them. This one I just plain forgot. Killer Dog is a novelisation of the film The Dawn Killer. I thought the book had first seen the light of day as a script written by Monica, but I'm not sure whether or not this is the case. The book is set on Romney Marsh, and that's where the film was shot too. The book isn't, however, a Tamzin story. innocent, and wait out on the Marsh to try and discover which dog is the attacker. If you've never read Dream of Fair Horses, you are in for a treat. It's certainly one of Patricia Leitch's best books, if not the best. When you read it, you can see where Jinny came from, but it's not necessary to have read the Jinny books to appreciate what Patricia Leitch does with the pony book here. What I actually want to do in this piece is quote reams and reams from the book, but I will restrict myself, because really all those quotations sit better when welded in to the rest of the book. The best pony book authors create characters who convince you no matter what end of the social spectrum they're from. Many of Gillian Baxter's heroines, like Bobby in the Bracken Stables books, and Frandia in Horses and Heather are monied. In contrast, there are those who approach the horse world from the opposite end of the income scale. Lindy Smith, the gipsies’ daughter of Horses and Heather, has to some extent taken on the behavioural models of her parents when she decides to keep the filly she finds wandering on the moors, though she knows she must belong to someone. was The Milkman's Cob (1961). The heroine loses her jumping pony Larke so stops riding, until the local Dairy converts to modern vans and 'Happy' the Milkman’s cob is to be sold. It is a lovely story of his transformation from pulling a float to winning at the Horse of the Year Show in the junior jumping. It’s told in the first person, by four different narrators, which at first I thought would prove irritating, but June Groves does get enough differentiation into her characters to make this work. It is one of those things that really dates you - can you remember the glory days of show jumping on television, when after the news finished (about 9.30 pm in those days) you'd get a full week of show jumping from HOYS? I remember the joy of being allowed to stay up to watch it (I had a mother who was keen on early bed times). 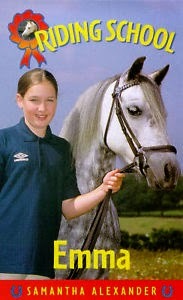 Dorian Williams (1914-1985) was the voice of show jumping on television. He commentated in the glory days of horses on television, when every evening programme of the Horse of the Year Show and the Royal International Horse Show was televised. Educated at Harrow, he had a full life: besides commentating; he was involved with the British Horse Society as a member of its council, and Chairman; and was instrumental in setting up the National Equestrian Centre at Stoneleigh. He was also Master of the Whaddon Chase Hunt. He used his family home, Pendley, for a Shakespeare Festival, and set up a Centre of Adult Education there. I'm spending the next few days rounding up the Monica Edwards titles I haven't yet covered (with the exception of one, which will have to wait until after HOYS). Today's is one of her most reprinted titles, Rennie Goes Riding (1956). The career novel was a feature of the 1950s, with series aimed at both girls and boys. 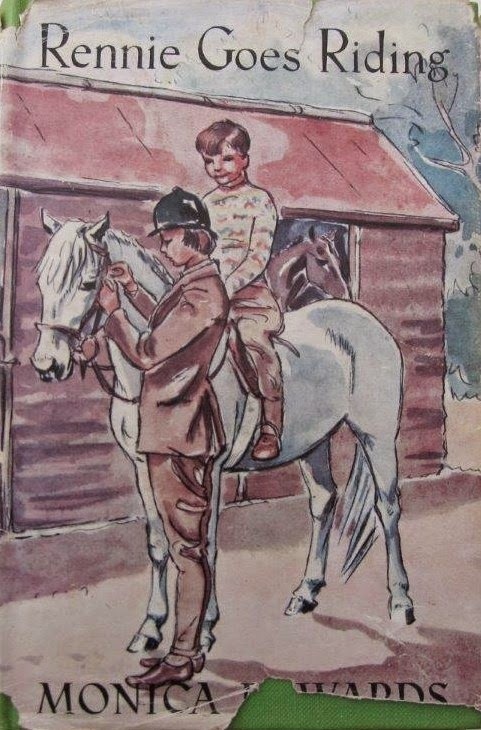 Rennie Goes Riding was part of a series published by Bodley Head which involved such stirring tales as Diana Seton, Veterinary Surgeon, Air Hostess Ann, and Margaret Becomes a Doctor.